Rental prices and demand for industrial real estate on Long Island are the highest they have ever been, real estate brokers, analysts and developers say. Amid improving economic conditions, growth in e-commerce and demand for space from New York City businesses moving east, rental prices for Long Island warehouses and factory buildings have reached records, and sales prices are high as well. Rent averaged $11.55 per square foot in the first quarter, and the median sales price this year was about $100 per square foot, according to CoStar Group, a commercial real estate analytics company. “We’re at the highest it’s been historically,” said Phil Shwom, president of Schacker Real Estate Corp. in Melville. In some cases, older industrial properties are selling for more than high-end offices, “an incredible phenomenon,” Shwom said. The demand — and a short supply of industrial space — have led developers and companies to make decisions that buck established trends. One of the most notable examples is Lake Success-based Stellae International, a logistics firm for the fashion industry. After struggling to find a large enough industrial space, Stellae last year purchased the former headquarters of Arrow Electronics, a 164,000-square-foot office in Melville, for $14.7 million. It will convert that space to an industrial property, and add two 50,000-square-foot expansions. Redeveloping office space to industrial use is rare in local real estate, brokers said. In the first quarter of 2017, vacancy rates for industrial properties were 2.9 percent, down slightly from a year earlier, according to CoStar. Average industrial rental rates for the first quarter rose more than 8 percent, reaching a “record-setting level,” said Albina Reydman, an analyst at CoStar. The median sale price this year was $99 per square foot for distribution space, close to the $101 peak price in 2008, CoStar said. Manufacturing space sold for as much as $110 per square foot, according to CoStar, though CoStar said the median for this year may adjust as more transactions occur. Much of the interest in industrial properties has been driven by warehouse and distribution operations seeking space, as opposed to traditional manufacturing businesses, brokers said. Over the past five years, the number of manufacturing jobs in Nassau and Suffolk counties fell by 1,700, from 73,300 in 2011 to 71,600 in 2016, according to Bureau of Labor Statistics employment data. In the same period, the number of jobs in warehousing and distribution grew by 5,200, from 32,600 to 37,800. Several factors are behind the region’s hot industrial real estate market. Economic conditions have improved since the Great Recession. Local businesses operating warehouses and factories have expanded to meet rising customer demand. Compounding that is demand for industrial space from businesses pushed out of New York by high rents brought on by the construction of high-rise luxury apartments and condos. Jerry Wolkoff, the developer behind the Heartland Executive Park in Edgewood, is in the early phases of building a 230,000-square-foot industrial space there. Wolkoff — who also does development in the city — said rental rates on Long Island are not high when compared with the city. “We’re seeing a lot of distributors,” he said. “The people that are coming out here sold their property in Brooklyn and Queens, and are buying” on Long Island. Online sales have grown at double-digit percentage rates every year since 2005, except during the recession, according to U.S. Department of Commerce data cited by the NPD Group, a Port Washington-based market research firm. In 2015, e-commerce garnered more than $341.7 billion in sales in the United States. “In today’s environment, the demand is greater for instantaneous purchase,” said Marshal Cohen, chief retail analyst for the NPD Group. To meet the growing demand, established retailers and platforms such as Amazon require more “regional” distribution warehouse facilities. At Rechler Equity Partners, one of the largest owners of commercial real estate on Long Island and the largest owner of industrial space in Suffolk County, rents from its industrial properties have grown by 25 percent in the past 2 1⁄2 years, said cousins Mitchell and Gregg Rechler, who head the firm. “We’re currently at 99 percent occupancy in industrial,” Gregg Rechler said. The firm, which owns more than 6 million square feet of real estate — roughly 80 percent is industrial — now has to arrange leases far in advance. The company is building the Hampton Business District, a $100 million, 440,000 square-foot complex of industrial, office and hotel space at Francis S. Gabreski Airport in Westhampton Beach. Rechler Equity broke ground on the first of nine buildings in 2014, and expects the park to be complete by 2021. 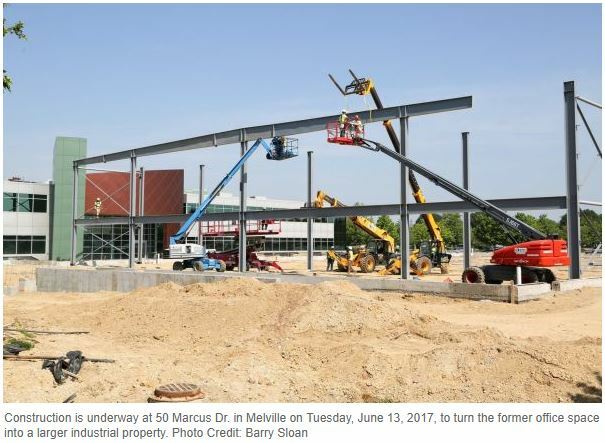 Mark Hamer, president of Harvest Real Estate in Jericho, is redeveloping Nikon’s former research and development facility in Melville into industrial space. Hamer originally planned to convert the 43,600-square-foot site, at 336 South Service Rd., into a high-end office property. The company changed course this year and is now seeking approvals to demolish the site and construct a 100,000-square-foot industrial building. Stellae International’s path to the former Arrow Electronics headquarters began when Schacker Real Estate looked for a large enough space to accommodate the company for nearly three years, to no avail. “We were looking everywhere,” said Jeff Starr, a consultant and broker at Schacker. “Once you get much over 100,000 square feet, there is a diminishing number of buildings that exist,” Shwom, Schacker’s president, said. Shwom got word in 2015 that 50 Marcus Dr. had been transferred from former owner RXR Realty to an investor. Built as an industrial plant in the 1960s, the property served as a facility for Raytheon before the weapons manufacturer left. In the late ’90s, it was sold to developer Reckson Associates, where it was then redeveloped into a corporate office for Arrow Electronics and later sold to RXR. CORRECTION: A previous version of this story mischaracterized the transactional history of 50 Marcus Dr., and gave the incorrect title for David Pennetta.